GOSHEN—”To Market, To Market” may soon have a new meaning in Goshen. Market Street, a one-way street in the heart of the village’s downtown, is going to be converted into a pedestrian-only park in what is part of a larger plan to enhance the Village’s downtown. The street is about 150 feet long and goes between Greenwich Avenue and West Main Street. It is flanked on the West Main Street side by Howell’s Café and tapa bar Craft 47, and on the Greenwich Avenue side by Rositas Fruits and Vegetables. The main retail spot on the street is the old Wonderbar, which has been vacant for years. The current pavement is going to be torn up and replaced with red brick pavers similar to the crosswalks that were put in last year except for about a four-foot wide strip of sidewalk that will be left in front of Wonderbar. There will be bollards on the West Main Street end to keep traffic out and double as bike racks, which the Village hopes will encourage bikers to stop in the Village (the Heritage Trail is one street over), and others to bike more. Planters will intersperse the bollards on the West Main Street side, and will act as bollards on the Greenwich Avenue side in that they will dissuade traffic, but will be moveable for when emergency vehicles need access. The bollards, said Lanc & Tully Principle Planner, Kristin O’Donnell, will screw off in case the Village wants to open the street up for events. Per the Village’s new enclosed dumpster regulations that take effect in October, the dumpsters and recycling bins that currently line the street will be put in “some kind of well-built carpentry piece that is going to be historic and attractive,” said Goshen Mayor Kyle Roddey. The exact location is still being determined but will be on the Greenwich Avenue side of the street. There will also be a couple of municipal tables for anyone to use, and there may be more from surrounding businesses that want to expand their outdoor seating. To mitigate the problems of the street being in a flood zone, there will be some trees and a rain garden along the side of the Howell’s Café building that will help to soak up the rainwater. “It’ll be like pea gravel. It’ll hold the water more than just pavement will … in kind of a natural-looking fashion as opposed to just putting in a metal grate or something like that,” O’Donnell said. It’s not going to result in an increase in taxes. The Village is taking advantage of a $35,000 federal Community Development Block Grant (CDBG) for infrastructure improvements that will cover redoing the drainage system on the street as well as the planters, trees, and rain garden. Roddey estimates about $6,000 to $8,000 of the roughly $15,000 project will come from the Village’s fund balance, and the rest will be covered by the grant. “The cost to tax payers is less than $10,000…and it’s not going to result in an increase in taxes,” Roddey said. The Department of Public Works (DPW) is doing the construction and the maintenance. The Market Street Pedestrian Park is one part of the Village’s Downtown Streetscape Improvement Plan, which outlines initiatives from improving lighting and signage to encouraging businesses to move into vacant storefronts. The plan was approved by the Village Board last September. There are several committees that have sprung out of that, such as the Greenwich Avenue Committee, the Sidewalks Committee, and the West Main Street Committee that have all signed off on the Market Street Pedestrian Park plan, Roddey said. We think it’s going to have a real big bang for our buck for economic development purposes. “We think it’s going to have a real big bang for our buck for economic development purposes, tourism purposes, [to] bring people in, [and] give them more stuff to do,” he said. Barring opposition from the adjacent businesses, he would like to put one of the “Keys of Goshen” pianos there in the warmer months. The Keys of Goshen is a project that will place decorated pianos on Goshen’s streets, available for anyone to use. Business owners in the area are generally supportive, but some feel the Market Street renovation will benefit some businesses more than others. Sarah Grillo, an owner of Howell’s Cafe, said she was in favor of it. Linda Mabie, owner of Linda’s Office Supplies on West Main Street, said she did not think it would help her kind of business, but thought it was a good initiative. “I think it’s European. It’s great. Do it,” she said. I think it’s European. It’s great. Do it. Owners of Goshen Hardware on West Main Street, Tom Foley and Tommy Foley, father and son respectively, said they didn’t see it having much of an impact on their business. “It[Market Street] is one way going out to Greenwich,” Tommy said. “That’s taking traffic away from the store, [so] maybe it’s better [to have Market Street blocked off],” Tom replied. Roddey said they chose Market Street because closing it down would have the least negative impact on nearby businesses, and because of its size. “It’s not too large where the cost is going to be astronomical, but it’s also big enough where we’ll have an impact,” he said. 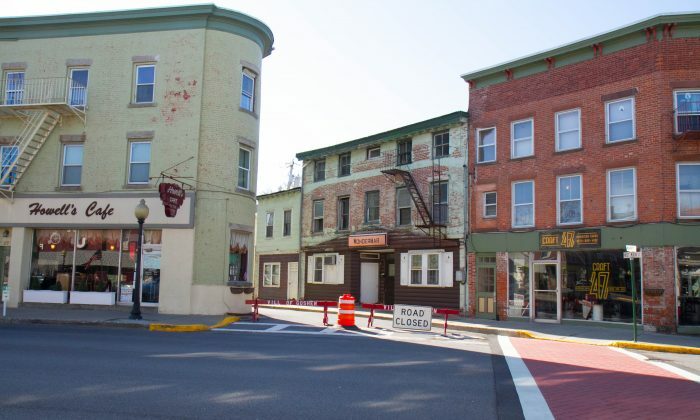 They are still soliciting feedback from the adjacent business owners before they finalize the plans, but they want to have it finished by April, which is when the state will be repaving Route 207/Greenwich Avenue. “We want to be aggressive so we can be done by summertime, but we also don’t want to rush and not take into account great ideas,” Roddey said. He estimates the construction will take a month.